I guess it was just a matter of timing, but a locked iPhone proved no match for a 17-year old teenager from New Jersey. 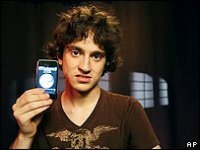 George Hotz has successfully managed to unlock the iPhone, allowing it to be used on other operators in the US instead of AT&T (such as T-Mobile, one of AT&T’s biggest rivals). According to George, unlocking the iPhone is not meant for newbies as it requires approximately two hours as well as certain soldering skills and programming knowledge. Both Apple and AT&T have not yet released any comment regarding George’s ‘exploits’, but chances are they won’t take this piece of news lying down. Certain analysts have faith that Apple might still have some time to change the iPhone production line that renders hacks such as this useless before the European launch occurs later this year, but this won’t change the fact that US models can be unlocked – a situation which could cause refurbished iPhones to be exported to other countries that have pent up demand. According to George, he hopes that iPhone owners won’t exploit his discovery for commercial gain. George also hopes to come up with a non-solder solution sometime down the future, relying on software alone to pull it off. That sounds like a much safer option by any means, and I’m sure you would be inclined to agree. If you have forked out $600 for one of these a couple of months ago, I seriously doubt you would want to risk your iPhone getting bricked as you attempt to use it on a different network other than AT&T. Of course, for those who love a challenge and don’t mind their $600 device ending up as a useless piece of junk, unlocking the iPhone would definitely be an interesting project to immerse yourself with. After all, being able to do so certainly earns you a whole lot of street cred and geek rep, in addition to the ‘cool’ factor as you chat away on other networks. I wonder how those folks in Hong Kong are feeling right now, especially after forking out more than a grand for one of these pseudo unlocked handsets (albeit using a different unlocking method there). This is a smart, remarkably skilled & intelligent 17 year old kid (could be considered a genius) and will definitely be the receiptient of a great career. Be selective George, consider your options, and DO NOT let any one take advantage of you. George Hotz, welcome to M.I.T. AT&T/Apple next time, open source, stupid. Great Blog! This may interest you. This video gives steps on How to Get Apple to give you a Free iPhone. I tried it out and it actually worked.